A green roof helps recapture and filter substantial amounts of rainwater, allowing a home to not only use less water, but also less heat. “Sustainable,” “green,” and “net-zero” features are becoming regular terms featured in the typical list of must-haves for homebuyers and builders. News outlets frequently feature stories on drought, fracking, and global warming, making homeowners more and more aware of their impacts on the environment. And with the recent recession, homeowners are also concerned about long-term operating costs. In response to demand, builders are increasingly offering a greener home archetype that simultaneously reduces environmental impacts and utility bills. But what, exactly, makes a house green? What sets a sustainably designed home apart from a power-guzzling McMansion? Probably the poster child for the green building movement, renewable energy sources like solar offer homeowners an immediate and significant decrease in utility costs. According to the U.S. Energy Information Administration, the average residential customer used around 30 kilowatt hours (kWh) of energy per day in 2013. A two-axis tracking solar panel assembly with 20 percent efficiency in an area like Los Angeles, where average solar insulation is around 7.2 kWh/day would only need about 224 square feet of panel area to reduce electricity costs to cents. And thanks to creative engineers, roof assemblies aren't your only option for solar nowadays. For example, the Solar Roadways project is raising funds to create solar panels that have the potential to electrify pavements for driving. In another project, spherical solar collectors can generate energy and make centerpieces for backyards and roofdecks. Shown here: A typical section of an airtight building envelope. Congratulations! Your heating, ventilation, and air-conditioning system is now solar-powered! But is your house making the most out of the system? Having complete control over the indoor air quality of a home makes heating, ventilation, and air conditioning easier and less energy-intensive. Taking cues from the European passive house building style, the most efficient home designs make use of super-insulated, airtight building envelopes to give occupants control over their indoor air space. These airtight homes typically include heat/energy recovery ventilator systems that condition air coming in from the outside while removing stale air from the inside. Triple-pane windows and massive amounts of insulation prevent any unwanted temperature changes. Using these concepts, homeowners around the world claim their homes run on the same amount of electricity it takes to operate a blow dryer. 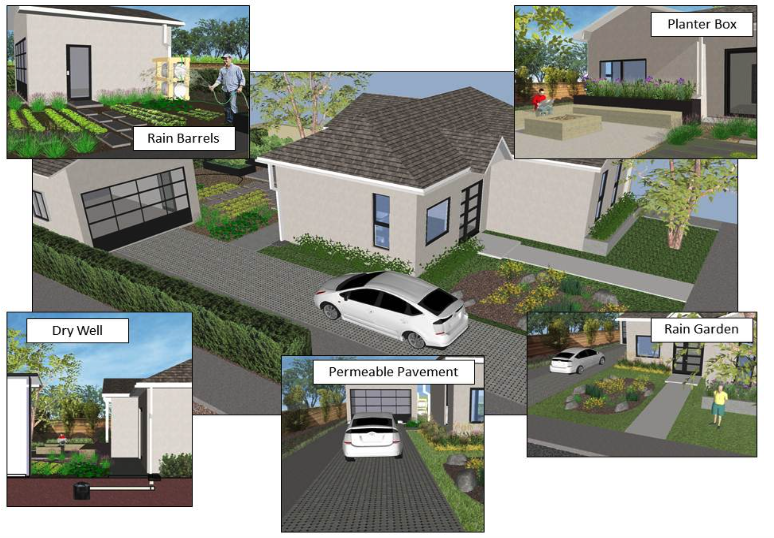 Examples of residential low-impact development devices provided by the City of Los Angeles Low Impact Development Manual. In areas like California and Texas, where droughts are causing water shortages, homes designed to use and discharge minimal amounts of water are beacons of sustainability. For many jurisdictions, certain stormwater management practices are mandatory for new construction. Low-impact development devices, such as infiltration basins and permeable hardscapes, reduce wear on existing stormwater infrastructure while recharging groundwater. Green roofs, such as the one illustrated at the beginning of this article, top off homes to provide both an area for recreation and a way to retain stormwater onsite. Even the water inside the home can be captured—graywater building systems can direct laundry and bathtub drainage outside to provide native plantings and drought-tolerant landscapes with the few gallons of daily irrigation they need. Building green is more than just a trend—implementing sustainable building technology into homes reduces operational costs and fosters environmental stewardship. Green building can encourage society to examine the effects development has on the natural environment as well as considering real ways to mitigate those effects. With enough outreach and education, average homeowners of the future can be just as green as the roofs over their heads. That's a blueprint we encourage! Martin Reyes is a civil engineer in training for the County of Los Angeles and a Blueprint Earth volunteer. To read Martin's blog about restoration efforts for the Los Angeles River, click here.